Excellent Time-line Photos of the Vimy Gun! Adding to the story! We have recently received some amazing photos of the Guns in Hopewell Cape which really helps in the guns timeline! One in particular from the photo collection of Verna Beaumont shows the Vimy Gun on May 9, 1943 sporting its green coat of paint. So we know from two dated photos the cannon was painted between 1935 and 1943 from the original camouflage colors to an army green. The cannons would stay green until they were refurbished at Gagetown in 1989 when they were painted grey. Cyril Cook in Seaman's Uniform, May 9, 1943 with unidentified man in Air Force uniform. Early Photos Circa 1920 of the Vimy Cannon in Hopewell Cape. Special thanks to Justin Raworth who shared the images of the cannon from 1920 and Terry Smith, who shared the pictures of Cyril Cook from his Mother's photo collection (Verna Beaumont). Cyril Cook was her uncle. Both pictures are dated 9 May 1943. 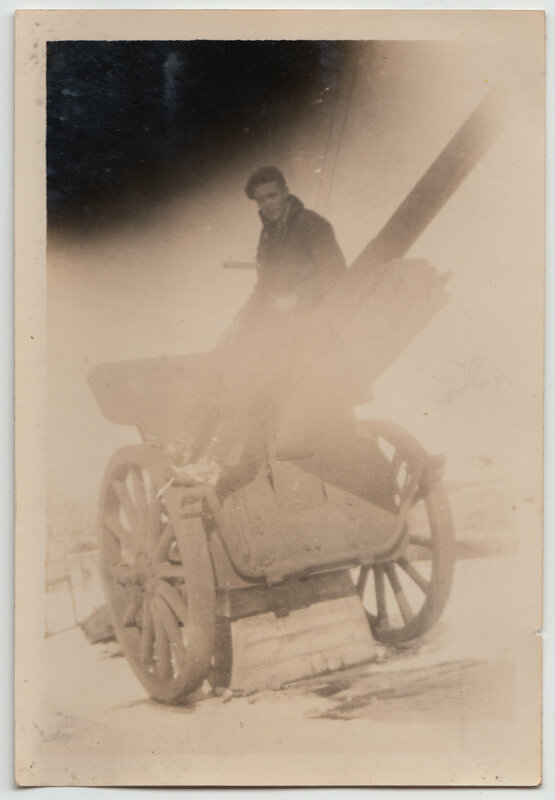 We have just received some amazing photos of the Hopewell Cape Vimy Gun from the family photo collection of Susan Richardson. With special thanks to Kevin Snair of Creative Imagery for scanning and sending them to us! Five are from the 1930s and one from the 1960s. 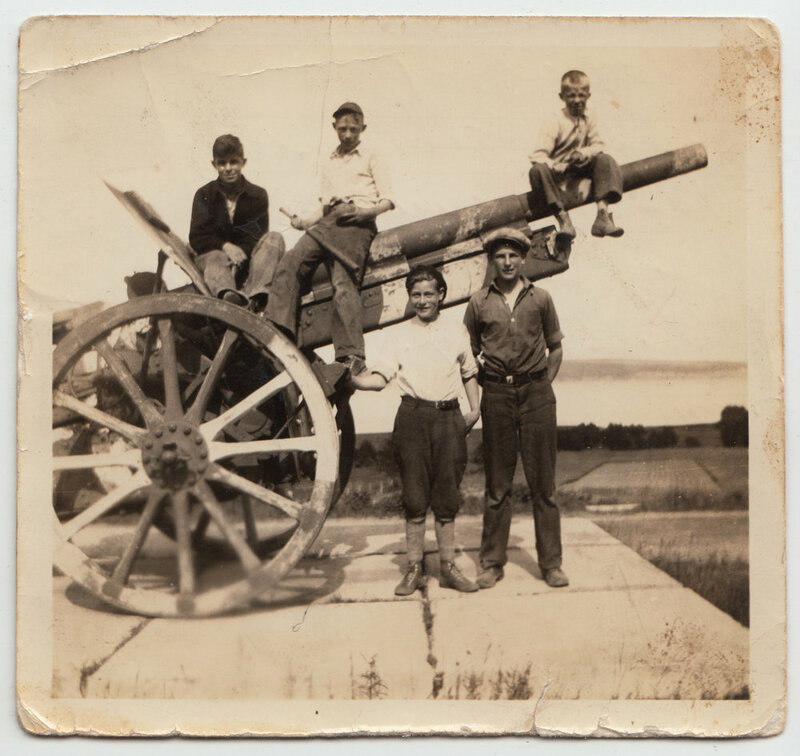 The photo of the five boys on the Hopewell Cape Vimy Ridge Gun is from 1935 and shows Douglas Higgins, Burton Fownes, Vernon Fownes, Cyril Cook and Harold Bishop on the gun. Isn't the camouflage paint job amazing! Cannon Captured at Vimy Ridge on Display at Hopewell Cape Square Circa 1920 - Sheriff Ernest W. Lynds in photo. We have recently uncovered what maybe the earliest photo of the First World War Trophy Cannons located in Hopewell Cape. This cannon was captured at the Battle of Vimy Ridge - April 9, 1917 by Canadian Forces. On April 11, 1917 this cannon was turned on the enemy by the Royal Field Artillery. In the fall of 1919 this cannon was awarded to the people of Albert County for raising the highest percentage of money over their set goal for any area in the province during the Victory Loans Campaign of 1919. Their set goal was $110,000.00, and the people of Albert County raised $347,600.00. Three times the goal! (In today's dollars that is equivalent to $6.2 million. Not bad for a population of 8700 people!) The cannon arrived in Hopewell Cape on March 4, 1920 by train to Cape Station, and then by horse to Cape Square. In the photo is Sheriff Ernest W. Lynds, and you can prominently see the plaque on the top left of the cannon stating how the cannon arrived in Albert County. It was 99 years ago today, (April 9, 1917) that the Canadian Expeditionary Force (CEF) fought the Battle of Vimy Ridge. It was the first time the Canadian Corps fought together as a single unit and achieved the first Allied Victory of the War. It was also the day the 27th Battalion captured the K14 10.5cm Cannon (s/n 590) that sits in Hopewell Cape Square. The people of Albert County won the cannon in the 1919 Victory Loans Competition for raising the greatest percentage over their target anywhere in New Brunswick. The County raised three times their goal of $110,000.00 with a realized sum of $347,600.00 (6.92 million in today's dollars). The capture of the K14 cannon is a story legends are made of, fighting in the third wave of the attack, the men of the 27th Battalion stormed the enemy lines, while Bandsman Paddy Smith played the regimental march on his piccolo. In the words of the company commander, "The battalion charged the last 50 yards with a cheer and leaped into the gun pits, where the gunners put up a stout fight. Our line lead by Captain Lane seized the guns, put out of action those of the crew who resisted and took the remainder prisoners, and prevented the guns from being dismantled." What a story of courage and sacrifice, it sends shivers down my spine every time I read it. Two days later on the 11th, these guns were turned on the enemy under direction of officers from the Canadian 6th ARTILLERY Brigade, and sent back several thousand rounds captured with them. So not only did our cannon fight for the enemy, the Canadians turned the cannon back on them and returned the favour. It's amazing, that the cannon which sits in Hopewell Cape not only fought against our troops, but then fought with them. What a story! That's not all though, through the detailed notes of the 27th Battalion, we can pinpoint on a map the exact location where the cannon was on the battlefield. Which we can view on Google maps, what was 99 years ago a battlefield, is now happily, a family's backyard complete with a swing set and slide. The cannon wheels of the K14 are in the process of being restored, our Wheelwright Mike Hartigan is currently working on them. What is left to do on the project, is to complete the restoration of the cement pads the cannons sit on. Then to give the cannons a good primer coat and paint them in their original camouflage markings. Then we need to develop a fitting way to tell their exciting story. The Museum is researching ways to best tell the cannons' story; from their capture on Vimy Ridge, to their being turned and firing back on the enemy, and then being won by Albert County in the 1919 Victory Loans Campaign. The Victory Cannon Campaign is raising funds to restore the two captured World War One cannons that sit in Hopewell Cape. These cannons were captured by Canadians during the Great War, and were awarded to the people of Albert County. You can donate online to the Victory Cannon Campaign here, and best of all you'll be sent a tax receipt! Click Here to Donate! Our Wheelwright has been busy over the winter months working on the set of wheels for the large cannon that Albert County won in the Victory Loans Competition of 1919. The K14 105mm was captured by Canadians at the Battle of Vimy Ridge on April 9, 1917, and was awarded to Albert County in 1919 for raising the greatest percentage over their set goal of $110,000.00 anywhere in the province. Albert County raised a total of $347,600.00, tripling their goal and this was with a population just shy of 9000 people. To bring this into perspective in today's dollars this would be $6.2 million! In case you haven't heard, the Gregg Centre from UNB along with the Provincial Archives is putting on a presentation called Sharing Our History, New Brunswickers and the World Wars this Saturday, March 19 from 1:30 pm to 4:30 pm at Resurgo Place in Moncton. Bring your artefacts - letters, diaries, photos - for show and tell and learn more about how your history fits within the greater New Brunswick and Canadian story! A Daily walk with the 26th Battalion - on Facebook! Please like our page to get updates on the 26th Battalion as the war unfolds. Now that's a story worth following! And just a reminder to check out our own 26th Battalion Stories and the Victory Cannon Campaign on our website. The New Brunswick connection to the First World War cannon captured at Vimy Ridge on April 9, 1917 and now found in Hopewell Cape, New Brunswick, just got better. Recent research completed on the German 105 mm K14 cannon, shows that the damage on the barrel of the cannon was probably caused by shells fired by the 4th or 6th New Brunswick Siege Batteries . 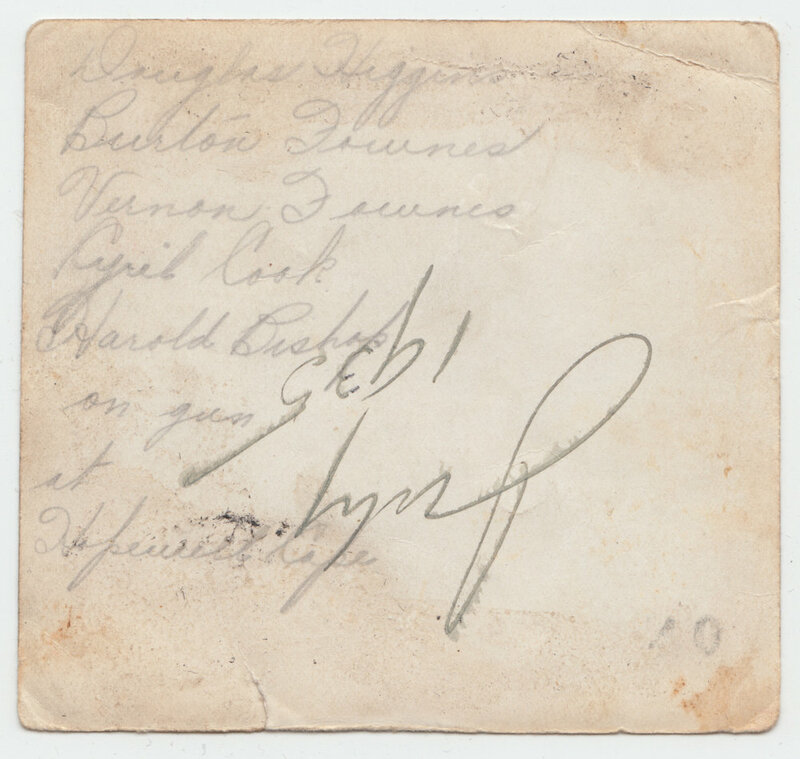 The exact location where the K14 was captured on Vimy Ridge is well documented in the war diaries of the 27th Winnipeg Battalion. In fact the diaries give the exact coordinates where the cannon was captured, and when checked against fire mission records for both NB batteries it was discovered that both New Brunswick Batteries fired heavy concentrations of 8 inch high explosive shells on those very German gun positions. Thus it is very possible that the fire that cut the gouge in the barrel was inflicted by New Brunswick's not nearly famous enough Heavy Artillery! Those NB Siege Batteries were formed in Saint John and included many men from Albert County, including Cyrus Gaskin (d. April 11, 1917). Gaskin is commemorated in the museum's First World War Roll of Honour, and was killed with the 4th Siege Battery not long after Vimy Ridge was captured as the heavies moved forward to help defend it. The 4th and 6th New Brunswick Siege Batteries are perpetuated by the modern 3rd Field Artillery Regiment (The Loyal Company) in Saint John and Woodstock. The large German First World War 105 mm K14 Cannon that sits in the square in Hopewell Cape, was captured at Vimy Ridge, April 9, 1917, and won by the Citizens of Albert County during the Victory Loans Campaign of 1919 for raising the greatest percentage of monies over their set goal. The people of Albert County raised $347,000.00 tripling their goal of $110,000.00. That is a pretty impressive resume for a gun. The Sparks Were Flying in Hopewell Cape this Week! If you were driving through Hopewell Cape this Thursday, you would have seen the sparks flying around the large German First World War Cannon as repairs were made to its metal work. The almost 100 years sitting in the square in Hopewell Cape were not the kindest to the large cannon, with considerable rust and corrosion around the base of the cannon where it rests on the concrete pillar. Thankfully we have local expertise to take care of that, Todd Steeves of TP Downey & Sons (Hillsborough) was able to come to the museum and make the necessary repairs without having to move the cannon. It is fantastic that we were able to find someone local with the skills and equipment necessary to do the job right so that it lasts another 100 years. Todd replaced the center brace and carriage bolts, the 2 brackets above center brace, and fixed the holes on side of cannon facing the road. When asked how the work went, Todd said, "The metal is a bit soft but with proper paint the metal should last another hundred years." The large 10.5 Cm K14 German Cannon was captured at Vimy Ridge, April 9, 1917, and was won by the Citizens of Albert County during the Victory Loans Campaign of 1919 for raising the greatest percentage of monies over their set goal. They raised $347,000.00 tripling their goal of $110,000.00. Pretty impressive for a county of less than 10000 people! Next on the list of repairs are the concrete pads! They say there is nothing stronger than the bonds formed on the battlefield, and the men of the 26th Battalion, who were in the thick of every major battle the Canadian Corps faced in the First World War, kept true to theirs for the rest of their lives. The veterans of the 26th Battalion organized the 26th Battalion Overseas Club after the war and held their first reunion ten years later in 1928. They continued to hold them every June 13th, commemorating the day the Battalion sailed for war from Saint John (for at least another 40 years). We have found two programs from these dinners: one from 1960 (the 45th year since the sailing) and the other from 1966 (the 51st year since the sailing). Both programs follow the traditions of the 26th Battalion and standard military protocol, with the prescribed singing of anthems, the prerequisite toasts and responses and the remembering of those lost to time. The menus included in the programs are similar and both ended with the S.R.D. (Seldom Reaches Destination). What is an S.R.D.? To find out you will have to attend the Commemoration Dinner on Friday, June 12 at 6pm. Our dinner, inspired by the 1960 45th Anniversary will be following the 1960 menu and program almost to the letter. It will give you a taste of what the men of the 26th Battalion experienced 55 years ago, along with a few additions that will liven up the evening. The Banquet is also a fund-raiser for the Victory Cannon Campaign, which will help restore the two captured German First World War cannons that sit in the square in Hopewell Cape. Be sure to grab your tickets early as they are going fast, and seating is limited. It is a great chance to experience a unique dinner and program honouring an important historical event. It was 98 years ago today, (April 9, 1917) that the Canadian Expeditionary Force (CEF) fought the Battle of Vimy Ridge. It was the first time the Canadian Corp fought together as a single unit and achieved the first Allied Victory of the War. 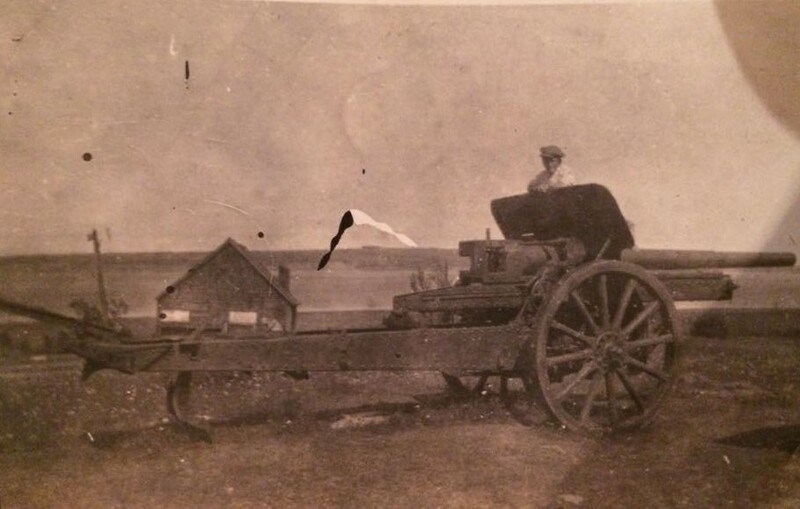 It was also the day the 27th Battalion captured the K14 10.5cm Cannon that sits in Hopewell Cape Square, which the people of Albert County won in the 1919 Victory Loans Competition for raising the greatest percentage over their target anywhere in New Brunswick. The County raised almost 3 times their goal of $110,000.00 with a realized sum of $317,000.00 (6.92 million in today's dollars). The cannon wheels are in the process of being restored, our Wheelwright Mike Hartigan has been kind enough to send some photos of his progress. Old spokes on new oak blanks, this is where we set the pattern for all the other spokes. One of the hubs and some felloe sockets are in the background. Roughing out a spoke on the bandsaw removing excess wood. Marking out the rough cuts for the cheeks on the hub end of the spoke. Rough cut spokes laid out in front of their intended new home. Practice spoke blank mounted on the lathe. Rough turned spoke ready for finishing. Each of the 24 required spokes will be individually shaped by hand using a spoke shave. Cracking the stud nuts on the hub. Some of them are really on there!